With more people seeking to save money by not having their own cars, more people are having to rent cars when no other form of transportation will do. For trips out of town, for example. Many of those car-free people live in Brooklyn and the rental car companies, having merged down to a concentrated oligopoly, are taking advantage. Charging big bucks here to make up for lower prices elsewhere. 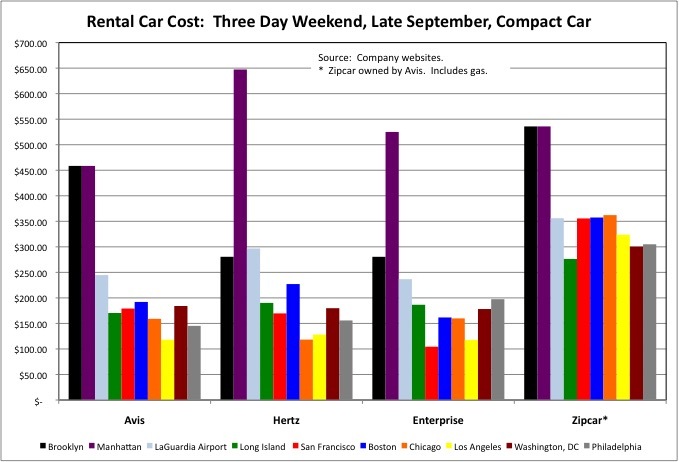 While contemplating a three-day weekend in late September, I realized just how much rental car (and shared car) prices have soared just in the past year or two. I was aggravated enough to spend an hour comparing prices. This post shows what I found. Yes, real estate in Brooklyn is expensive. Yes rental car taxes are high. Yes prices are going to be higher at peak times, such as summer weekends, Thanksgiving and Christmas. And rental cars are really, really cheap in places such as Florida. I get that. But I’m not comparing Brooklyn with Florida. And I’m not checking prices for a summer weekend. Almost all of the rental car options are more expensive in Brooklyn than at LaGuardia Airport. Avis/Zipcar charges as much in Brooklyn as in prime Manhattan. (They used to charge more if you lived in Brooklyn, even if you were renting in Manhattan, another source of aggravation). Moreover, all the rental car companies charge far more in Brooklyn than they do in prime areas of Boston, San Francisco, and Washington – not cheap cities by any means. Not 10 percent more. Not 20 percent more. We’re talking 50 percent more, 60 percent more. And in the case of Avis, 150 percent more (more than double) those cities. And approximately triple Chicago or Philadelphia, and quadruple Beverly Hills. Avis/Zipcar/Budget seems to have particularly stuck it to Brooklyn since the three companies merged. We grabbed a Zipcar to have dinner with some relatives over in New Jersey recently. Given the amount of hours to get there and back, it was cheaper to get it for the day than sweat getting it back in few enough hours. One relative who has used Uber checked his App, and found we could have been driven, both ways, for the same money. The fact that a new, independent business hasn’t shown up to compete implies some kind of anti-competitive factors, either inherent or manufactured, must be at work. Would the three conspirators cut prices by two-thirds if a competitor showed up in Brooklyn, and then send them soaring again when the competition was gone and people were dependent again, like OPEC’s cheap oil? Are the limited available locations in Brooklyn monopolized? Is the State of New York only providing information on driving records to existing companies that make campaign contributions? Why isn’t the State Attorney General looking into this? You’d think one of our placard-holding pols would have noticed this issue. Apparently for them, the executive/financial class, the non-car owners of Brooklyn are just a bunch of serfs. Now as it happens we have another option. Our own car, which is upstate with our child at college. We can take a bus for $120 each round trip, and use the car when we get there. 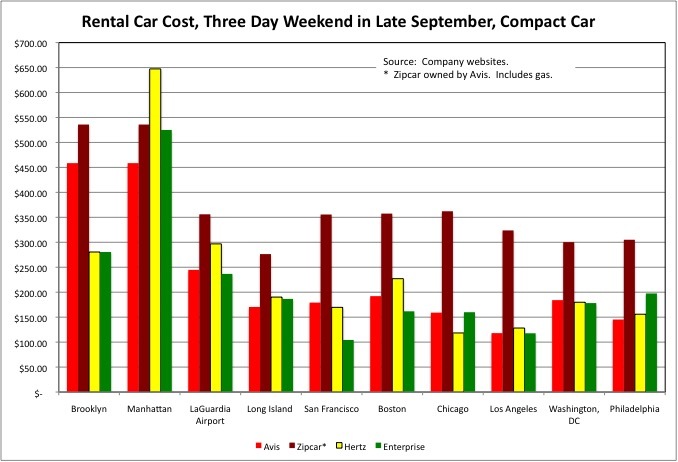 We did that in the summer, but I thought that in the fall, and not on a peak leaf weekend, the rental car or Zipcar option would at least be in the ballpark for two people, even with $100 added for gas and tolls (or perhaps $40-$50 in tolls for the Zipcar). It used to be. The rule was one person is better off with the bus or train, but two or more could choose the relative luxury of a rental car. Not anymore. Yes we could afford the rental car, but we don’t enjoy being ripped off. Even when the public sector and taxes are involved, and we have no choice. So the bus it is. But if we do rent, and when we have to rent, here’s a message for Avis/Budget/Zipcar. I liked you better when you were three separate companies. Screw you and the horse you rode in on. This entry was posted in Uncategorized and tagged avis, brooklyn rental car, enterprise car rental, hertz, zipcar on July 23, 2015 by larrylittlefield.